Food. It’s a huge part of the American culture, and it’s something we just can’t stop talking about. There are a lot of myths floating around out there, and with the innovation of the internet, there are quite a few opinions. The answers were pretty surprising. Here are the top food myths…that you probably believe. 1. The word “fresh” always means healthy. Ever hear brands use the word “fresh”—especially fast food brands? Frank urges people to stop associating the word “fresh” with “healthy,” as this is merely another marketing gimmick. “Do your homework and make sure that you truly understand what you are putting in your body,” he says. Personal trainer, fitness model, and founder of Fit And Ageless Over 50, Barbara Wade agrees with the fallacy of the word “fresh,” adding that many seem to equate frozen with being lesser. “Frozen produce can be as nutritious as fresh, since it’s flash-frozen shortly after picking, which means that it retains more nutrients than if it has to travel unfrozen for days,” she says. Everyone has heard of Dr. Oz and his incredibly popular health show. However, too many people have come to take every word out of his mouth as absolute fact. It’s essential to keep your guard up when it comes to the media, and remind yourself that they are trying to sell you something, even if it’s not directly. “Always keep in mind that when something sounds too good to be true, it usually is,” says Ficek. 4. There is an absolute “right” way to eat. Sure, it’s important to “eat right”—but this doesn’t mean there is one absolute way you should be eating. This is another way the media tries to control us into giving them our hard-earned money. 5. Diets are always the way to go. There are a thousand and one diets out there, but healthy eating shouldn’t just be a temporary diet, but a permanent lifestyle change. “One should always eat healthy and not have extremes of very low caloric intakes or food group elimination,” says nutritionist and certified dietician Sharon Richter. Steer clear of fads like “the three-day military diet” and remember: if it sounds too good to be true, it probably is. 6. You can fix a crappy diet with supplements. Put down the supplements and vitamins, and listen up. You can’t get everything you need from a pill, according to registered dietician and author Liz Pearson. “Whole foods provide a complex mix of nutrients and plant compounds that can’t be replicated in a pill,” says Pearson. 7. Fat is bad for you. Fat has often been demonized, but the reality is that fat is necessary for a healthy lifestyle and body. 8. Fat is worse than sugar. Most people check the label for fat content instead of the real villain: sugar. Even if there is “bad fat” in a product, the low-fat version is often no better. “For example, reduced fat peanut butter adds tons of chemical to lower the total fat intake—not healthy,” says Richter. 10. Lower calories always means more healthy. 11. Counting calories is necessary to lose weight. Often, when people are trying to lose weight, they immediately start keeping a catalogue of their calorie intake. Though intentions are good here, the root of this is flawed, according to Splaver. 12. Caffeine is bad for you. Pearson suggests no more than 400 mg of caffeine daily. 13. Skipping meals will help you lose weight. Often, people will skip breakfast or lunch, thinking that the less calories, the better. However, this is essentially starving yourself. Intermittent fasting is good for you, but by skipping meals without giving it any real thought, we’re actually doing more harm than good. Instead, says Austin, we should consume small, nutritious meals every few hours throughout the day. 14. “Diet” products are better. How many times have you seen someone order a big, unhealthy meal, coupled with a Diet Coke? Unfortunately, those diet products won’t just keep you from getting heavy, but can actually damage your efforts more than their regular counterparts. It’s best to steer away from the bad stuff altogether, but if you absolutely must have a soda, it’s best to just go with the real thing instead of the diet version. 15. Juicing, paleo, vegan, gluten-free, etc. is the way to go. Food and diet trends aren’t exactly a new thing, but they’ve been extra popular as of late. However, sticking a label on it doesn’t necessarily make it healthy. “In general, I’m tired of the micro managing of diet and the labels that support that,” says Galardi. That includes juicing, paleo, vegan, and even gluten-free. Be mindful of what you eat, but don’t demonize based on a simple label or diet trend. 16. If you’re thin, you’re healthy. Just because you have a little extra weight around the thighs doesn’t mean you are unhealthy, just like being super thin doesn’t mean you’re super fit. Everyone’s body is different. Listen to your body and stop obsessing over your reflection. When you are healthy, your reflection will follow. 17. All carbohydrates are bad. You’ve probably heard all sorts of things about carbohydrates, but they probably all come down to this: they’re bad. So if “good carbs” are necessary, how did this huge myth start? David Zulberg, author of The 5 Skinny Habits: How Ancient Wisdom Can Help You Lose Weight And Change Your Life Forever, explains that low-carb diets claim that carbs cause the quickest rise in blood sugar, so preventing this would be preventing less fat and less likelihood of diabetes. According to registered dietician and nutritionist Kimberly Tessmer, it’s not too many carbs that cause weight gain. “It’s too many calories in general, whether carb, protein, or fat, that is the culprit,” explains Tessmer. 19. …and you should never eat right before bed. Another myth involving time is that you shouldn’t eat before bed. Often, people tend to think that eating before bed will cause weight gain because your body doesn’t need to digest food at night. 20. There’s no difference between organic and regular produce. You’ve probably heard a lot about organic produce, but don’t let anyone tell you that organic is a myth. 21. Organic produce has higher nutritional content. 22. Organic foods aren’t worth the price. 23. There are “good” and “bad” foods. Sure, some foods are healthier than others, but judging them as “good” and “bad” is too black-and-white. 24. The way to lose weight is to eat less and exercise more. Your body needs food as fuel—especially if you exercise. The “eat less, exercise more” myth is one that will starve your body. 25. 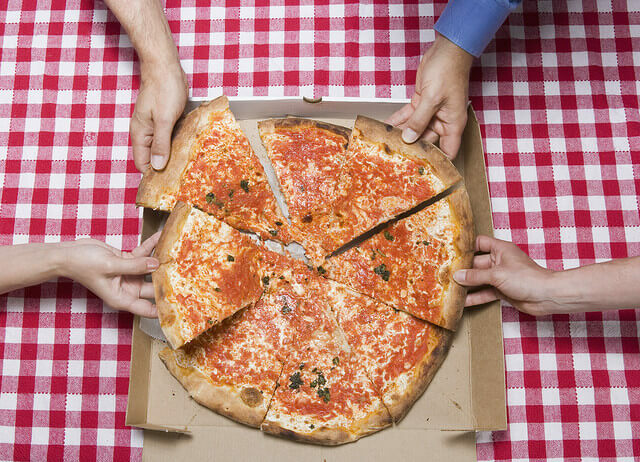 Food is the center of all social activity. To hang out with friends and loved ones, food does not need to be involved. When we choose foods for social activities, we often choose the unhealthy ones because we assume that our friends and loved ones prefer them. This needs to stop, says Idol. 26. Healthy foods don’t taste good. How many people do you know who view health foods as punishment? News flash: healthy foods can be delicious. 27. You can eat as much healthy food as you like. That being said, this doesn’t mean you should eat an entire fridge-full of fruits and veggies every single day—they still have calories, and though eating healthy calories is better, it’s still important to remember that eating too many calories will lead to weight gain. “If you take in more calories than your body needs, you will store it,” says Wade. 28. _____ is the root of the problem of the obesity epidemic. How many times have you heard this sentence with some random nutritional jargon thrown in? People are always trying to point fingers at what has caused obesity in America—but that concept itself is a myth, according to Jenny Evans, nutrition and exercise physiology expert and author of The Resiliency rEvolution: Your Stress Solution For Life. 29. Red meat is bad. Good news for meat-lovers: you can have the occasional slab of steak, guilt free! Food is a tricky part of life, but it doesn’t have to be. Don’t let yourself fall victim to these nutrition myths. Listen to the advice of these nutrition experts: eat healthy, be kind to your body, and start to notice how amazing you feel!